This WordPress widget plugin makes it easy to add a banner from N0NBH’s site showing solar & terrestrial data to a WordPress site. The widget is configurable, allowing the site administer to select which banner to display. This widget plugin has been tested on WordPress 2.9.2 and should work on previous 2.x versions as well. PHP 5.x is required. Add a directory called ’hf-solar’ (without the quotes) to your ‘/wp-content/plugins/’ directory. Upload hfsolar.php to ‘/wp-content/plugins/hf-solar/’ directory. Place the widget in the sidebar using the editor for your theme. Choose the particular type of banner you would like to display. Go to the Manage Plugins page. Active the plugin through the ‘Manage Plugins’ page. 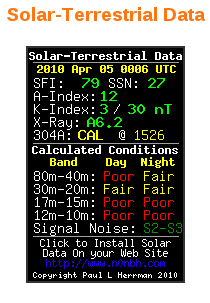 The HF solar widget allows you to choose which type of banner you would like to have displayed. Works great on the latest version of WP, installed right from the plugin gallery in the admin panel. Now March 2013 with WordPress 3.5.1 -> works perfect , thanks. WordPress 4.1.1 4-16-2015 works great. Thank You. Working on WordPress 4.2.2 so far! Thanks! Plugin installed 100%, but does not seem to update at all. Keeps on showing an old date? I have the same problem of plugin not updating in WordPress. Also having an issue on my WordPress site that the widget does not update, instead showing out of date data. This appears to be somehow tied to the cache. Something is preventing it from reloading an updated image. I run wordpress and it will not update. Please advise fix. The latest wordpress, HF Solar Plugin stop update. Any hint?